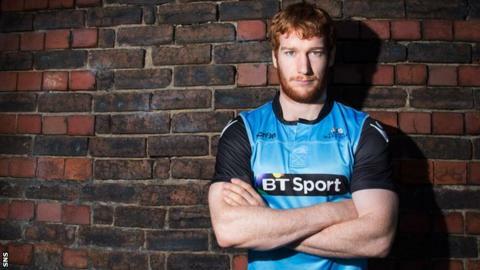 Rob Harley hopes a vocal home crowd can help Glasgow beat Toulouse in the European Champions Cup at the weekend. Warriors lost 19-11 to the four-times European champions on Sunday in France, but could exact revenge on Saturday. "When you look at the energy Toulouse played with, they were feeding off the crowd and that can help get you those 50/50 calls," Harley said. "When you've got the crowd behind you, you get little boosts so hopefully we can pack the place out at Scotstoun." Two yellow cards ensured a difficult day in France for Warriors, who performed well in patches. Gregor Townsend's side now sit second top of Pool Four but they are just three points behind Toulouse and remain in with a great chance of reaching the knockout phase. A win on Saturday would be a major boost to their hopes but Harley insists they have to sharpen up in key areas. "We played well in some regards but came up against a really good side who kind of taught us a lesson in controlling the penalty count, being clinical and taking the chances," the 24-year-old flanker added. "I really enjoyed seeing my team going up against one of the best teams in Europe and putting on a really good performance, putting them under pressure at times." "In the opening half hour I was happy with how we played the game, the areas and the pressure we put on them. At this level, against a side of that quality, when we do have our moments of pressure within their 22 we need to come away with points. "We'll go back and watch the game to see how we can improve and see what we're going to do differently next week. "We've come over here believing we could get the win but credit to Toulouse, they are a great side and they played well today. It puts pressure on us for next week and it's crucial to our campaign to defend Scotstoun as our home." Head coach Townsend, meanwhile, is "very confident" his side can qualify from the group. "I really believe in the players," he added. "The team have shown this season what they are capable of." And on Sunday's performance, Townsend said: "I felt pride [when the final whistle went], I really enjoyed seeing my team going up against one of the best teams in Europe and putting on a really good performance, putting them under pressure at times."